Photo Finish is a four-player minigame from Mario Party 4. Its name is a reference to photo finishes, which happen when two or more racers cross the finish line at almost the same time and a photo needs to be consulted to determine the winner, since the naked eye could not. 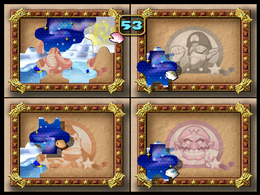 The picture is shown on the screen, then it splits into four sections, one for each player. As the screens zoom out to reveal the players watching the picture, the picture suddenly breaks and the pieces fly out, surprising the players. The screens zoom back in as the cursor holding the first piece appears. The game begins. Photo Finish consists of a puzzle divided into eight pieces. Players will get to see the completed puzzle for a short time before it splits. Players must piece the puzzle together, one piece at a time. If the player has the correct orientation and location of the piece, it will fall into place and the next piece will appear. The first player to piece together his or her puzzle is the winner. There are three puzzles: Toad's birthday party, Penguin's ice rink and Shy Guy's car. There is a 60 second time limit, and if no one finishes their puzzle in the time limit, the game ends in a draw. Toad's birthday party: The player will do a winning pose while two Toads raise champagne between him/her. Penguin's ice rink: The player will skate in circles. Shy Guy's car: The player will ride in the car and wave. If the timer runs out, nothing will happen on the screen besides the announcer saying "Draw! ", though the Draw music will play. Rules – "Please finish this photo puzzle. You can only drop a piece in its proper place, so you'll know when you've found the correct spot." Advice – "Focus on the picture, so that you remember which way the pieces face." Spanish ¡Rehaz la foto! Redo the photo! This page was last edited on December 8, 2018, at 13:40.